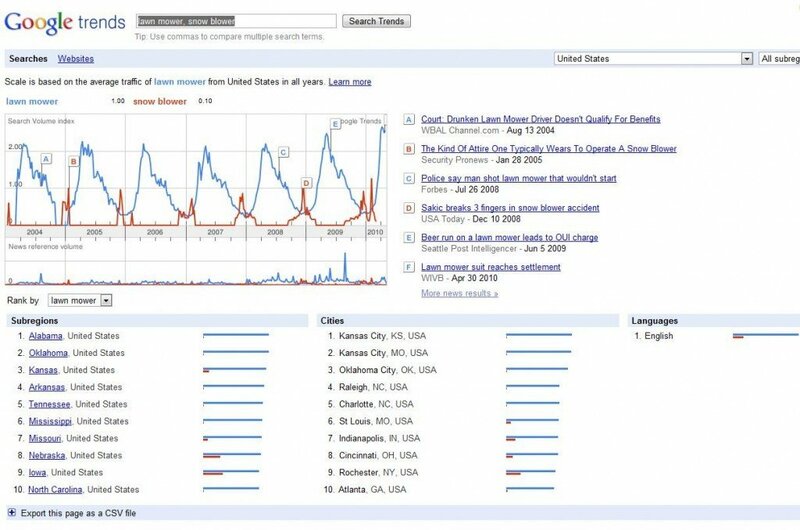 Google Trends offers a good look at year-over-year data for search volume. Google Trends can be a very effective tool for planning your SEO campaign if you know how to use it. The tool is a great way to look for seasonality and “burstiness” of topics online, which is especially important to review if your client has season-related products. Using Google Trends you can establish a target date where your campaign needs to come to fruition, which allows you to allocate your resources appropriately in order to reach your target. As an example, I’ve used the terms “lawn mower” and “snow blower” because they obviously have very season-related sales. You can see in the image below the year-over-year number of searches for the two terms. You can see that “lawn mower” peaks around May of every year and then drops off as the season wears on. If a client sells several seasonal items, you can see the importance of using the time leading up to May to prepare for the peak lawn mower season. You can also see in the image below, that searches for “snow blower” peak in December – January of a given year and is subject to bursts of traffic related to major snowfall. As an example, I’ve used the terms “lawn mower” and “snow blower” because they obviously have very season-related sales. You can see in the image below the year-over-year number of searches for the two terms. You can see that “lawn mower” peaks around May of every year and then drops off as the season wears on. If a client sells several seasonal items, you can see the importance of using the time leading up to May to prepare for the peak lawn mower season. You can also see in the image below, that searches for “snow blower” peak in December – January of a given year and is subject to bursts of traffic related to major snowfall. Another good use of this tool, beyond seasonality is illustrated below; the ability to measure one phrase’s popularity against another. This is a good way to evaluate some of your long-tail phrases. In the image above you will also notice a couple of other really important things; rankings of states and cities. This information can help you specifically target your PPC campaigns to cities and states where the most searches for your items occur. Another important thing you can see is the ability to export the results to a CSV file which allows you to present your own graphics and charts outside of the Google tool. This is great if you are doing research for a client and want to brand your results as your own. Don’t worry too much about the alphabetized article results displayed to the left when you are looking at a huge period of time as in the image above. These links point to news stories that will give you a very small glimpse into what items and on this scale, much of the content is dead. In the image below we’ll look at 2009’s trends related to these categories. You can get a little deeper look at a single year’s trends like this as well as looking at which cities and states performed the best for a given year. You can get a solid peak month for your campaign by using the single year view. The Google Trends yearly view of results show seasonality in detail. The single-year results can also be exported to an CSV file to allow you to play with them in Excel. Earlier I said you should ignore the alphabetized article results on the left, but in this case these articles can be of use. If you click the “more news results” link you’ll be taken to a page where you can see the articles that trended throughout the year. This will help you determine market-factors that drove the number of searches and find out what was going on in the industry to help explain the search volume. You’ll be able to find seasonal trends like the effect of huge snow storms on snow blower searches, and the effect of drought in regions on lawn mower sales. When the grass doesn’t grow, sales go down. One last thing I’ll mention about the “more results” is that there is more data here than meets the eye. Since Google has been indexing offline content such as newspapers and books, you have a deep look into information going all the way back to the 1800s in some cases. Though data from that far back is probably not relevant to today’s market, it is very interesting to see. 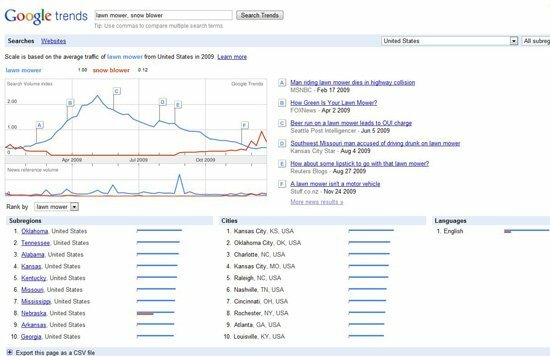 Google Trends shows mentions of items in offline material. To sum up, there is a TON of data available to the SEO in Google Trends if you know what to look for. You can offer a wealth of information to your clients to help them see why you want to focus on certain campaigns leading up to the busy season. They will better understand why you want to focus so much effort on organic SEO for “snow blowers” in the summer instead of when they are selling. The more the client understands the data behind your online strategy, the more likely they will value it as a part of their company’s strategy, instead of just a “bolt on” curiosity.